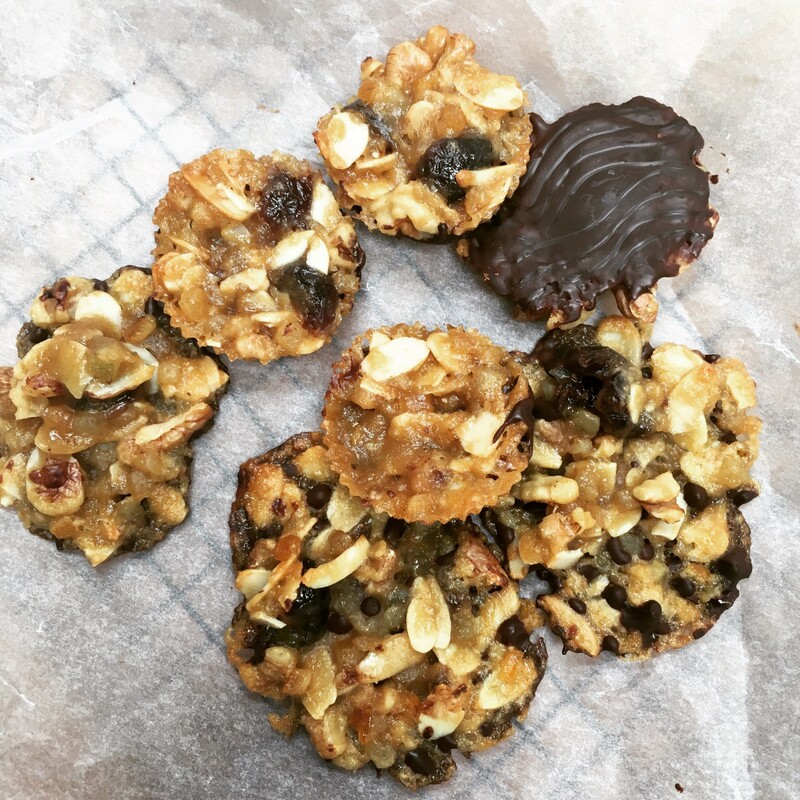 Florentines —a deceptively simple delicacy! I am again attempting to persuade you to try making these at home, rather than going for the easier though far less satisfying option of just eating these out of a packet. #homemadeisbest and homemade gifts are even better! And these are very easy —everything just goes into one pan — so it is again a fun recipe to do with little ones. The hardest thing is probably making sure you don’t burn them, but even with charred edges, these will still taste delicious. 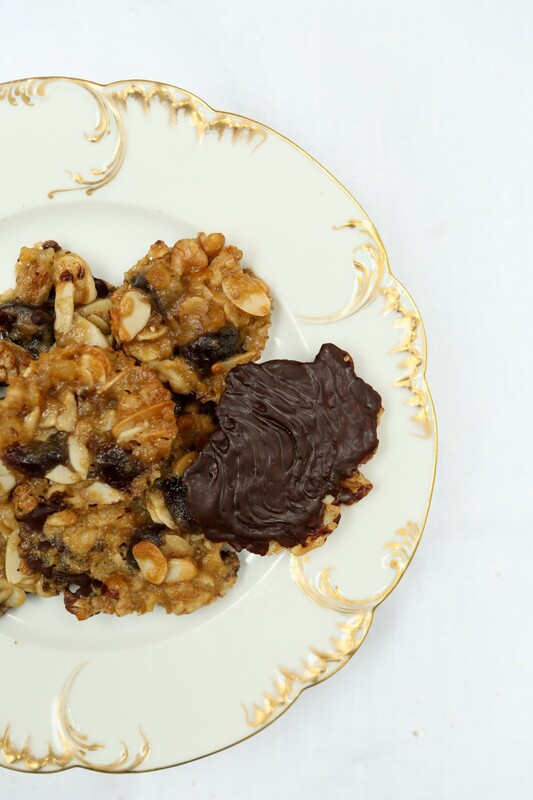 Florentines are nutty, chewy biscuits that are usually (preferably) covered in some sort of chocolate on one side. There are so many different variations of a florentine recipe — you can go crazy with whatever tickles your fancy, or whatever you have left in the back of the cupboard! What they all have in common is a lovely chewy caramel base, some nuts (usually almonds, at least), and dried fruit. My personal favourites are with dark chocolate at the base, as I find the bitterness counteracts the sweetness of the biscuit just right! 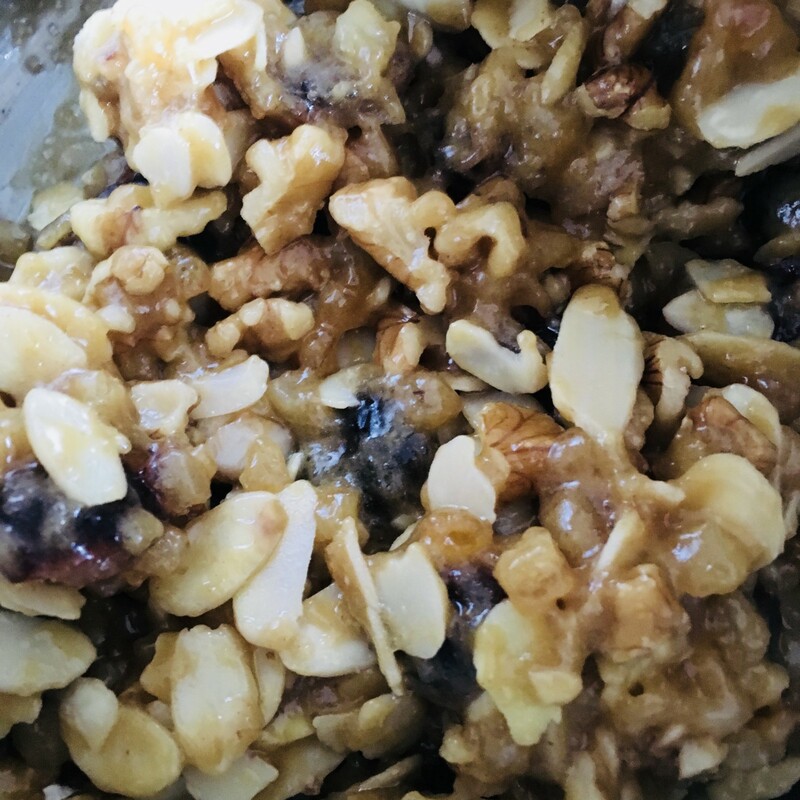 I have seen versions with pistachios, cranberries, dried cherries — even coconut, if you like. And of course, coat with milk or white chocolate according to your preference. I have made a baking kit for this recipe, so if you can’t be bothered to go out and buy all the ingredients, head to my website and I’ll do all the hard work for you! However, if you have half an hour to spare, some people to impress or a birthday coming up, here goes. Pre-heat the oven to 180C/160C fan. Melt the butter, sugar and golden syrup together in a small pan. The sugar grains should dissolve by the time the butter has melted. 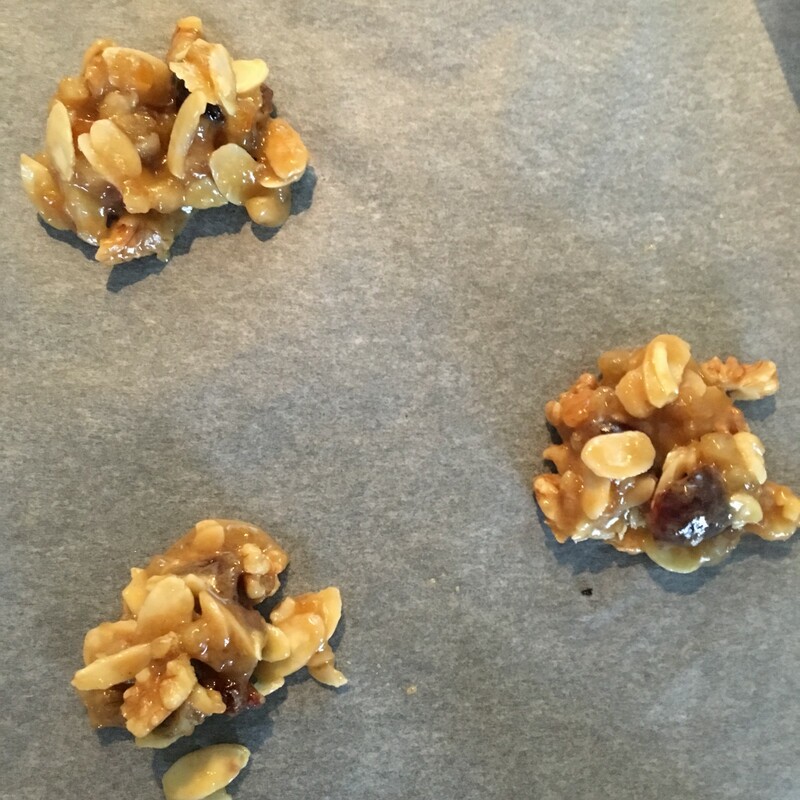 Remove from the heat, and add in the nuts, dried fruit, and flour, and mix well until everything is well combined. 3. Put a teaspoonful of mixture into each cupcake case (or onto a the baking paper) and spread it on the base. 4. Bake for 8–10 minutes, until golden brown. 5. Once cool enough to handle, remove from the cases and put on a cooling rack to cool completely. 6. Meanwhile, gently melt the chocolate in a heatproof bowl, over a pan of simmering water. 7. Once the biscuits have cooled, use a teaspoon to coat the back of each one with chocolate. Wait a few minutes for it to lightly set, and drag a fork through the chocolate to create a wave-like pattern. 8. Wait for them to dry completely — and enjoy! Founder of www.justbakit.co.uk, foodie, city escapee. Europe is my home!